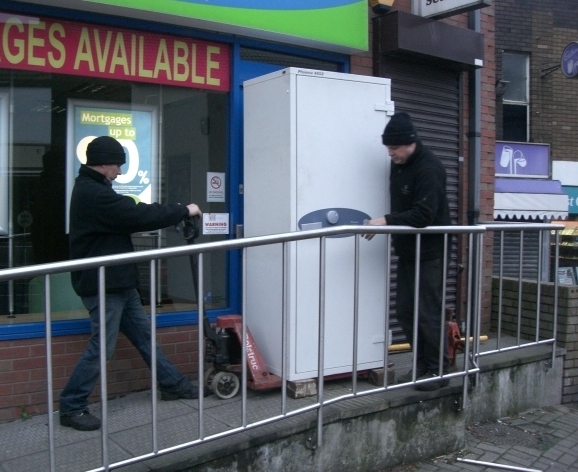 Things to consider when removing or installing a safe, security cabinet or fire cabinet, would be what route to take either in or out, as it needs to be measured & examined carefully. Door widths & heights along with how square the frame is compared to the floor is important when things are tight, doors & frames may have to be removed to get the safe through. When moving a safe or large object floors are over looked at your peril, safes can often exceed the weight limit of joists & other floor supports, they may need to be propped or even the load spread by other means. Floor coverings such as tiles don’t flex under load so will crack if not protected properly. Steps up or down are always problematic, stability of the safe is very important, time & care needs to be taken to avoid accidents. Gradients & uneven ground present obvious problems with load control & will cost time. Windows can be a easy way of extracting or installing safes especially on upper floors if frames can be removed easy enough. The safe can be craned through the window size depending which will avoid damaging lifts or struggling with stairs, a site survey is usually best if there are any obstacles that could present a problem. If a safe has been in site for some time, building alteration post installation may prevent easy extraction, occasionally brick & studded walls need to be removed.